Being in a long term loving relationship is not easy. Add a few children, jobs, mortgages and over-scheduled activities, romance comes in last place. How often you can live in the same home with your partner and lose track as to why you love each other? You might be going through the motions just to survive our hectic lifestyles. So what can you do to get of that rut and rediscover why you are in this relationship in the first place? My favorite choice is to take a little get away from the kids, home and work responsibilities. Spend at least 24 hours dating each other again. Enjoy a morning with out the kids or dogs waking you up so you are not totally too exhausted to enjoy ones company. Well that is not always a possibility for many reasons not to mention it is probably not realistic to do too often. Make a weekly date night. This can be done at the house when kids are in bed or leaving the kids home and running for coffee of a glass of wine once a week. Really just making one night, one hour alone to discuss life. We have tried this and will do it for a few weeks and then life gets hectic again. Buy a couples game? Many “couples” games can me more geared toward the physical intimacy if you know what I am saying. You know you have to go to one of those stores you would hate to be seen doing so. While those can be fun at times, to make the relationships work you need to first get on the same page emotionally with your partner. 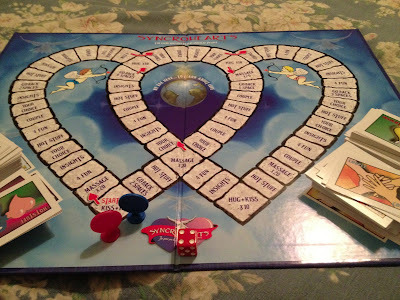 Have you heard of Syncrohearts it is a board game and now an app. Developed by Bobby O’Neal, aka, Dr. Love, this game makes you answer questions that you may not have asked each other in years. Yes there is some intimacy involved but not like the games we discussed earlier. Syncrohearts is a meant to help couples openly express their thoughts and feelings and grow as a couple. It one the Mom’s choice Award in 2012. To learn more about Syncrohearts and connect with Dr. Love in time for Valentine’s Day, check out on their website or Facebook Page. I was provided this game to review, no other compensation was offered and all the opinions expressed are my own.